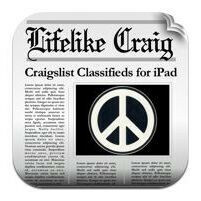 Craigslist apps are nothing new, and even Lifelike Craig HD for iOS has been on the market for a little while. But for only $2.99, Lifelike Craig HD provides a much more user-friendly experience than the real Craigslist.org itself. The best part of Lifelike Craig HD is the way it spruces up the general interface. The iPad version in particular offers a newspaper-like layout, including photos, which is a vast improvement over the standard list view. Another great feature is the ability to save listings. When you do so, a red penciled circle will appear on the item, just like you were browsing the classifieds of yesteryear. When you're logged into your account, you can create new ads, and edit/delete them. The process of adding photos is also simplified. The standard Craigslist requires you to take the picture, transfer it your computer, resize it, and then post it to your ad. But with Lifelike Craig HD, you merely snap a photo from your iOS device, and immediately upload it to your ad. For the avid bargain-hunter or garage-sale expert, a mobile Craigslist interface is essential. And while there are a number of competitors out there, Lifelike Craig HD is by far the best, especially for the iPad.